We live in an age in which large volumes of information—“big data”—are generated and collected rapidly to add value to our daily lives. Industry has harnessed data to target advertising, tailor medical treatments, and even develop the technology and infrastructure that allows us to carry miniature computers in our pockets that will pause active functions to accept incoming phone calls. The agricultural community wants to use big data to help farmers make decisions that will increase yields and deliver safe, nutritious food to communities around the world. Researchers and farmers use predictive modeling to identify best management practices for getting the best crop and livestock performance under various environmental conditions. To make the most accurate predictions, models based on even the most advanced machine learning algorithms must be rooted in comprehensive datasets. Such datasets often include numerous weather and soil measurements as well as corresponding plant or animal performance assessments under multiple management regimes over multiple years. But how “big” is big data, anyway? If you were to print each of the 2.5 billion DNA bases that comprise the genome of a single corn plant, you would end up with a stack of printer paper taller than the Statue of Liberty. That’s pretty big, and it only sheds light upon a single perspective of our multifaceted agricultural systems. Train a workforce that can manage, analyze, and manipulate large datasets. 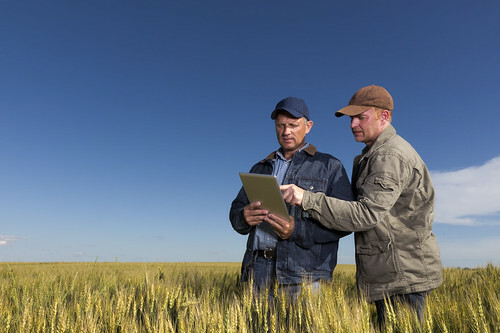 Ultimately, NIFA seeks to help the agricultural community harness big data in ways that enable all people, at all times, sufficient access to safe and nutritious food. NIFA invests in and advances agricultural research, education and extension and promotes transformative discoveries that solve societal challenges.